We’re celebrating! Summer begins, and brings with it the first anniversary of the Artigiano blog! To mark the occasion, we are proud to present a brand new giveaway of a special item – handmade in my little studio – exclusively for this drawing. I hope this pretty bellflower pendant will be a wonderful treat for a lucky reader. 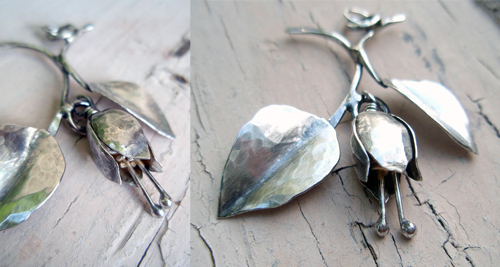 This forged one-of-a-kind sterling silver botanical pendant ($165 value), is about 2” long by 1 1/2” wide and captures a bit of summer for all seasons. Like a tiny mobile sculpture, this piece is comprised of moving parts to make it all the more lively and fun to wear. Scroll through our blog or use the archives list in the right column, choose one story to read, and submit a comment at the end of the story. Sign up here for our e-mail list! (not necessary if you are already on the list). We send only occasional messages or updates and do not share our list. The graphic at the end of this post is an example of our e-mail messages. Want to double your chance of winning? Come back to this article and submit another comment here (comment links are at the top of the stories), indicating which favorite article you have commented on and that you would like to be included in the drawing a second time and you will qualify for 2 chances. Fulfill these guidelines and you will have a chance (or 2) in the drawing, to be shipped to a lucky reader before summer’s end. Note that the necklace will only be shipped within the US so please have a US residential address to qualify to receive the prize. The winner will be notified via e-mail once a name is drawn and I’ll request your shipping address then. Claim your prize and it will be shipped out promptly with delivery confirmation! This is our second 2nd giveaway drawing, which I’m happy to offer with special thanks to all who have encouraged and supported Artigiano though the year! All the amazing comments and feedback, the continued support of my wonderful local customers and friends, as well as the encouragement from the Etsy community of artists, treasury makers, and micro business supporters continue to make this endeavor a delightful and hopeful experience. Good luck, and much appreciation to all! And the winner is… Sheri (SWS)! Congratulations! Thank you so much to all who all who participated and took the time to look at the blog and comment! I hope you will stay tuned to see what’s in store! 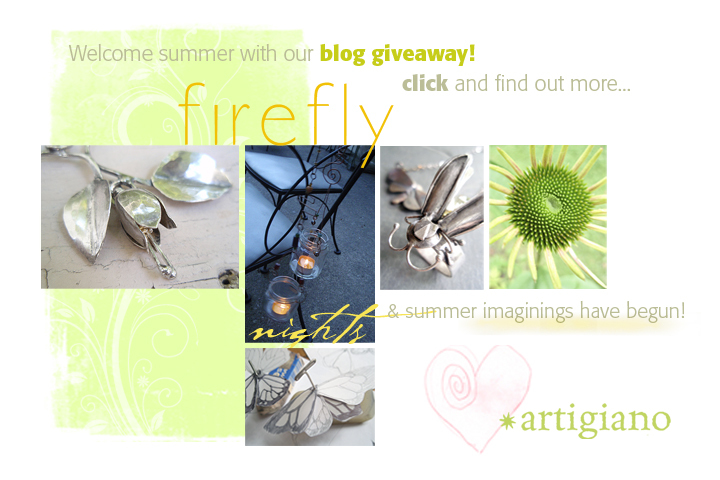 Oh my gosh… your giveaway is just gorgeous! Please enter me again – I commented on your life drawings, which is so nice to see along with your metalwork. Fingers crossed! You work just keeps amazing me! Such a treat to see it evolve. I want a 2nd chance!! – Commented on your Blackbirds because I LOVE the design (of course I love all your designs). The bellflower reminds me of you. One of the best flowers in my life. An interesting thing about bell flowers. They seem to follow you with their caring smile. But seem to turn their head when you take a glance back. Always keeping you in their gaze. Foxgloves are the best at this botanical ability. Brilliant in their various colors, and still stand tall when the weather deems otherwise. I always agree how your work so astutely depicts our botanical environs! Congratulations on celebrating your 1 year blogiversary! I love to see your works in progress as well as your foodie creations. If forced to pick a favorite, its a tough choice but my vote is for the blackbirds and your winged creations. They make me feel free :)) If you would be so kind to include me in the summer giveaway drawing I would be extremely grateful. Thank you! I read and commented on “Midsummer message” and am really looking forward to following your blog and creative endeavors. I also hope to be entered in your Summer giveaway. Thank you! I would love a second entry! I commented on your post about your dad and his treasures. I love your jewelry, and how you create, and how you are making new treasures. Thank you for the chance at a spectacular piece! I posted on the Angels with black wings post. Your work and blog are lovely.